Nature's Hideaway is one of five "Idea" gardens within the University of Illinois Extension Master Gardener Demonstration Gardens in Springfield.. Nature's Hideaway encourages family gardening using readily available, inexpensive materials and seeds that are fun and easy. 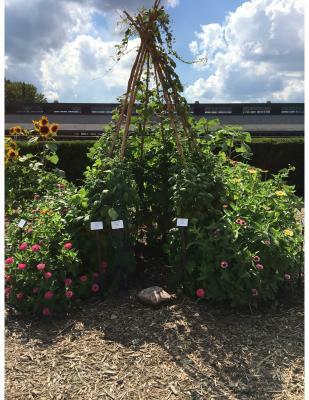 This garden features a bean teepee surrounded by zinnias, a small vegetable bed, and flanked by sunflowers in each corner. While scouring bean plants for remnants of those very persistent Japanese Beetles and removing expired leaf debris from the teepee a hidden treasure was discovered . 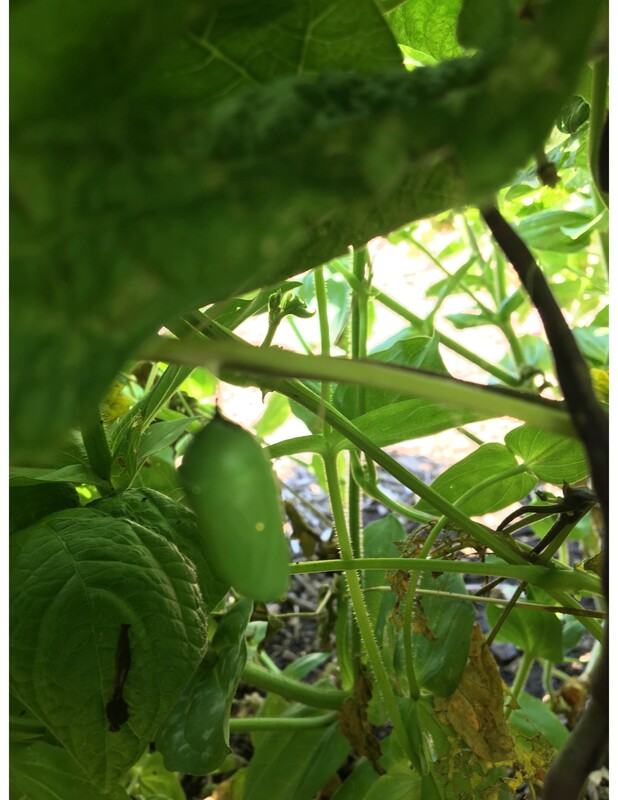 . .
A Monarch chrysalis was observed. 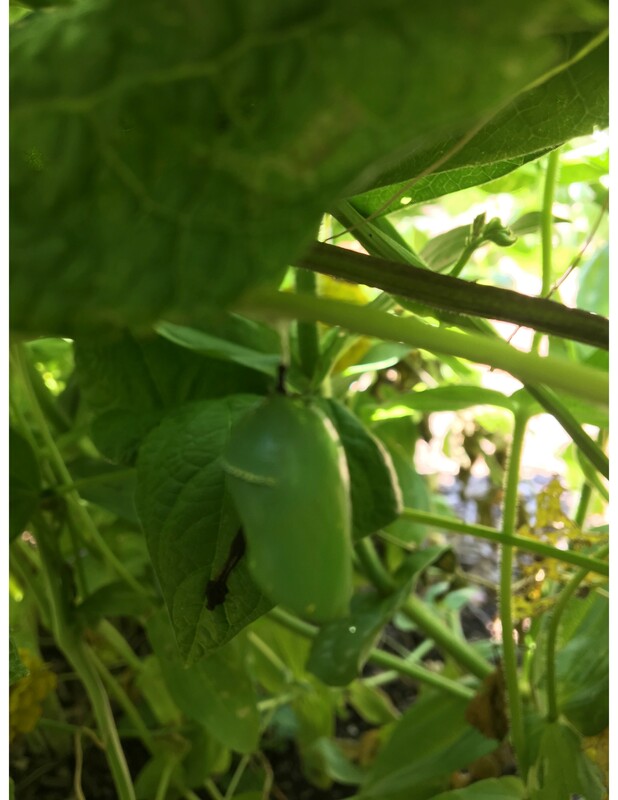 Master Gardeners have observed the chrysalis daily and have already seen changes; note the outline of wings in the picture. What a great hiding place! We are fortunate to have a "Pollinator Pocket" Garden with several varieties of milkweed as part of our Idea Gardens and are so pleased that at least one Monarch caterpillar has found a perfect hiding place in "Nature's Hideaway Garden." A wide variety of bees, caterpillars, butterflies, and moths are regularly observed enjoying sustenance and shelter within the gardens. Please come out to enjoy a variety of gardening ideas expressed in five different garden displays. The French Country gardens originated in England in the early 18th Century and spread to France. They were oftentimes inspired by paintings of such artists as Monet. The gardens can be as formal (such as neat manicured beds and clipped hedges) to wild and rambling beds. The colors can range from cool pastels to bolder colors and give off a rather romantic feeling. Nature's Hideaway encourages family gardening using readily available inexpensive materials and seeds that are fun and easy. Gardeners can help support pollinators through "pollinator pockets." Mini-gardens with selected flowering plantsthat provide food and shelterto bees, butterflies and other creatures vital to our own food supply. A Sensory Garden is designed to stimulate the five senses – taste, touch, sight, smell and sound using plants with different shapes, sizes, colors, textures, scents and flavors, as well as other elements in the garden. The Difficult Gardening Plot demonstrates gardening options in difficult situations. Creation of borders to conceal street traffic, potted plants when time and space are limited, and plants that "hide" poles, antennas, etc. are shown. Other gardening options include easy to grow plants, such as zinnias, in other than optimal soil conditions and plants that require little care such as succulents. The demonstration gardens are located on the Illinois State Fairgrounds, Springfield, in front of Building #30, along 8th street. If you have questions, call (217) 782-4617. Contributing author, Karen Kirk, University of Illinois Extension Master Gardener volunteer.